I ran track for six years. Something my coaches frequently stressed to our team was the importance of running hard through the finish line before decelerating. They told us a lot of races were lost because runners would start to slow down before crossing the finish line. 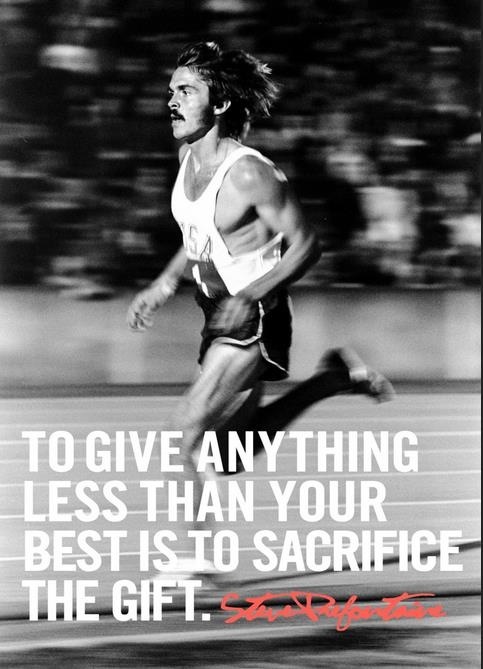 Runner Steve Prefontaine said, "To give anything less than your best, is to sacrifice the gift." I love this quote and I think about this it all the time! We have the opportunity in life to do anything we set our minds to. Maybe that means going to the gym and working out. Or cleaning the house. Or running a marathon. When you workout don't just go and workout, push yourself, you will get more out of your workout and leave with a sense of accomplishment. If your cleaning your house, really clean it. If your running a marathon push though the physical and mental roadblocks and cross that finish line. What ever you do, give it your best! Your best may not be enough for everyone, but knowing you gave something your all is something to be proud of! Don't sell yourself short. You can do it! Cross that finish line!